Matching Dragoons: Jonah Hex #22 "Requiem for a Pack Rat!" Jonah Hex #22 "Requiem for a Pack Rat!" "Requiem for a Pack Rat!" I missed my chance last issue. 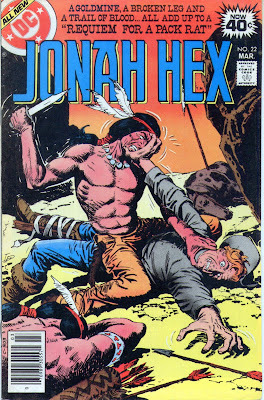 I could have touted this issue as "Jonah Kills Lobo!". Oh, well. 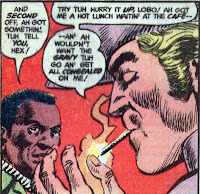 The story starts off with Jonah leading a black crook, Lobo, to the gallows. Lobo is being hung a day early cuz the hanging man just has sooo many hangings in sooo many towns. Needless to say, Lobo is pissed and takes it out verbally on the town & Jonah Hex. After the hanging, Jonah goes into a general store and encounters an elderly black man, Pack Rat Benson, a friend from way back. Pack Rat tells Jonah that he has finally hit a big gold strike and is working it with his wife, his father, two sons and a grandson. He invites Jonah back to the mine to stay for a few days. They leave the store and another black man leaves the store, rides out of town and meets up with his two brothers. It is Diablo, Lobo's brother, and he meets up with his other two brothers, Nat & Rafer. They have this weird habit of referring to everyone as 'brother so & so', kinda how some folks in church do, but since these are evil brothers of an evil man, it sounds even weirder. Anyway, they are somewhat peeved that their brother was hung early since they had planned on springing him free during the hanging. 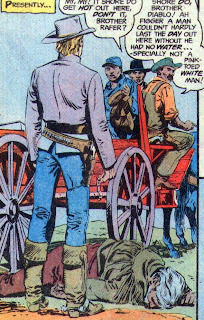 They decide to hunt down Jonah Hex, kill him and then steal all of Pack Rat's gold. Several hours later, Jonah & Pack Rat are riding along in Pack Rat's buckboard. Pack Rat shows Jonah a map outlining a watering hole about 7 miles away and then a whole lot farther on to the mine. Just then two shots hit Pack Rat in the chest and he pitches over backwards, breaking the back of the buckboard seat. The three evil brother show up, take the map, steal the horses and the wagon, take all the canteens, insult Jonah Hex right to his face, and then shoot him in the leg, breaking it in the process. After they leave, Jonah grabs the broekn buckboard seatback, breaks it lengthwise and then sets his own leg. With his leg tied to one half of the board, he uses the other half for a crutch. 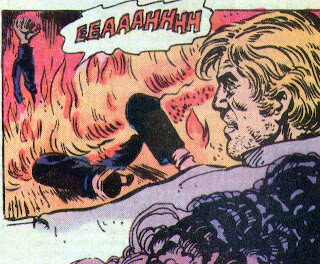 With a passing reference to the upcoming US centennial and the Spirit of '76, Jonah Hex hobbles off across the desert. Night falls and the three brothers make it to the mine. The family has been waiting for Pack Rat and are very surprised when the brothers burst in, slap them around, and then eat their dinner. Jonah makes it to the watering hole, drinks up and passes out. The next morning Jonah wakes up just in time to see two Sioux warriors riding hard towards him. The first one is wielding a spear and Jonah manages to throw his knife right into the Indian's chest. He grabs the fallen Indian's quiver of arrows and manages to stab the horse the other Indian is riding, and in hand to hand combat (straight off the cover), he stabs the Indian with another arrow. With one horse dead and the other run off, Jonah is once again faced with hobbling across the desert. He grabs a bow & quiver of arrows and then goes scooting on his rump down a mountainside. Back at the mine, Diablo tells Rafer to take Pack Rat's sons to the mine and force them to dig the gold for them. Diablo tells Pack Rat's wife to go fetch some water from the well. She heads out but finds Jonah hiding behind the well. He pulls her down and when Nat goes out to check on her, Jonah pops up and shoots an arrow right into Nat, killing him. Up at the mine, Rafer thinks he hears something and when he leaves the sons to check on it, he encounters Jonah, holding a stick of dynamite. Well, you can guess what happens. Jonah now hobbles back down to the cabin, kicks open the door with his good leg and just as Diablo is about to shoot Jonah, Grandpa slaps Diablo with his cane. Jonah dives into the room, knocking Diablo into a table and overturning an oil lamp. The cabin catches fire and as they are fighting, the cabin collapses on Diablo. Pack Rat's sons pull Grandpa & Jonah out of the fire and the story ends in a blaze of cabin-glory. Timeline - Nothing referring to any other Jonah Hex stories but the phrase 'upcoming centennial' and a reference to the "Spirit of '76" in between May 10, 1876 and July 4, 1876 since th epainting was exhibited at the World's Fair in Philadelphia that year. I would probably have to place this in June in order for Jonah to have learned of the painting, which was originally known as "Yankee Doodle" (I haven't been able to learn when it was renamed). 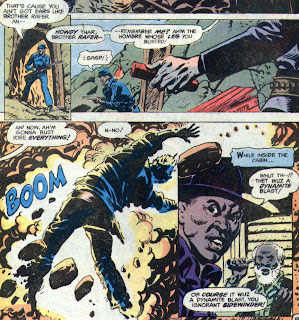 This story, character-wise seemed to be an apology for Fleisher's portrayal of Blacks back in WWT 22. All the major characters, both good & bad, are African American. After this issue I can't think of another where see other Blacks portrayed. A fair issue, nothing really advancing the character of Jonah Hex, that will be forthcoming next issue. Next Issue - More dynamite, more history, them damn Irish, and the introduction of Mei Ling. Sounds like a typical Jonah Hex adventure! Even a broken leg won't slow him down! I do however wonder about a June of 1876 timeline. There was something ELSE happening up in Montana around about that time, and I highly doubt that there would be any random Sioux warriors about. They and the Cheyenne were all just about to hand Custer's head to him.